I am going to do the sawdust method today. Anyone have a clue where I would get saw dust? Would something like this work? I get it for my horse stalls and once the pellets get wet they turn into saw dust. Last edited by perfectstorm; 09-21-2015 at 07:55 AM. Back up from 2015. Is anyone planting trees? I've a got dozens of acorns and persimmons seeds stratifying in the fridge. This will be my 1st year to try my luck at growing them from acorns. I had some luck with persimmons growing last year, but lost a lot in the late summer when I forget to water them enough. I also just ordered a dozen seedlings from Nativ nurseries to plant. How did they know you were doing an inside grow operation? Electric bill high or something? How would you plant this Burr oak acorn? Shell off? Looks like a red oak. The stripes are the tattle tell. The exact name escapes me. Here are some pics of the tree, bark and a leaf to go with the acorns I posted earlier. Does this help identify? How far South with white oaks grow? Is South Texas too hot for them? I understand they will need additional water, as rain fall down South is not enough. Just wondering if they would survive the heat of the summers. But the burr oak saplings I dug up have done well on their own. Live oak acorns have done well. As long as you are planning on long term. I have a 20 year old live oak from an acorn that is as big as your waist. My experience is in the sandy/clay soil of Leon county. Fertilized and limed with mulch around the bases. Everything must be caged where the deer can’t nip the limb tips. Bug And tall cages with small openings in the wire. Our soil is too alkaline. They require acidic soil. But you can find hybrids between white oaks and bur oaks for sale, and they can tolerate our alkaline soil. 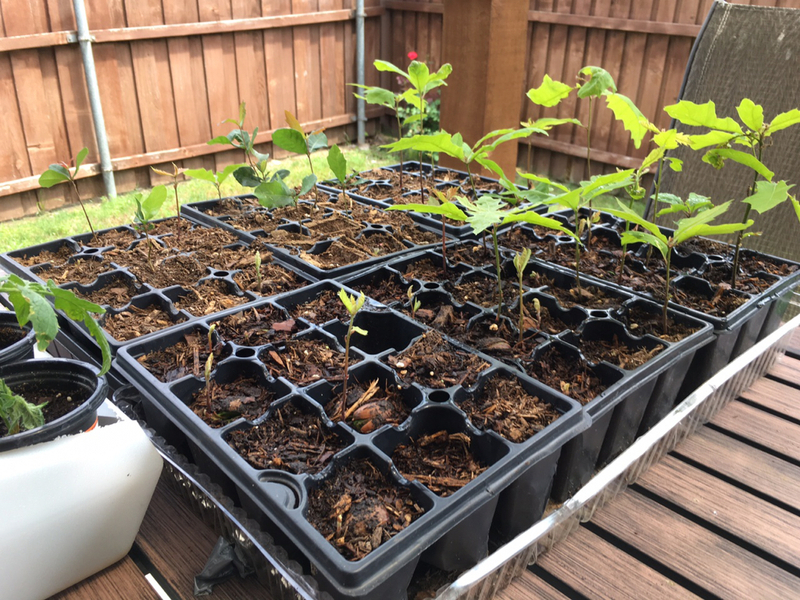 These often go by the name "Bebbs Oak"
I do a lot of tree planting, but have been having more trouble with Post Oaks than I have with any of the other species I've grown before. Specifically, I've never had animals jump so many hurdles to eat any of the other species I've grown. Everything wants to kill them. Even mice and rats were going through and over the cages I put around them to stop the deer, hogs, and rabbits from eating them. Now I have to use mesh wire for the cages and even enclose the top. This is actually why I'm planting them though. Post Oaks and other species like Bigtooth Maple are suffering from extremely low recruitment of seedlings because they're getting eaten. Primarily by the deer, whose populations are arguably at an all time high. 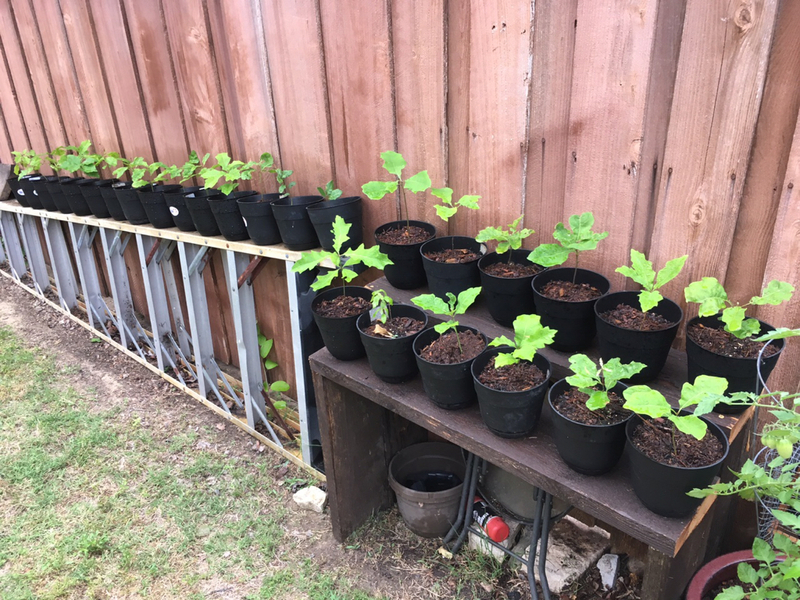 I started my acorns in flower trays on the back porch after leaving them in the refrigerator all winter. Then transfer to small pots. Seems to be working pretty good at this point. Especially since removing the squirrel that was digging some up everyday. Red, bur and live oaks. Not sure how they will do through the summer, but hoping to have 50-75% survive to plant in the ground this winter. Question for the nerds... What type of Oaks to plant? I had the crew that put my septic dig (rock hammer) some tree holes (4'dia and 4'deep). I figured i would bring in some quality soil and water everyday with a timer. Should I plant 35 gallon trees? I planted Texas Ebony seeds from my lease about 4 years ago. They are about 2-3' tall now. I took a knife and put a small chip in the seed and soaked in water for 24 hours. Then planted. I had 36 that looked just like those in black buckets last year. 1 squirrel ate all but 6 in one day. I shot him from the kitchen table. And the 6 survivor are doing well this spring. Hope to plant this fall (moisture permitting). If you're going to have a reliable water source on a timer, and if you're going to fill a hole that big with good dirt, then you have a lot of options. If the primary purpose is attracting wildlife, then you might want to choose Chinquapins. If the purpose is aesthetics/shade near your house, then probably Burr Oaks. But again, many options. love this thread, have grown several from acorns. If you look up a plant species, say Quercus Alba (white oak), look at the "wetland status", you will see it is Facultative upland. That classification means it needs dry soil to grow. The different classification are below. You can determine where to plant a particular species on your property by the preference of their wetland tolerance. It is very accurate. Hope this helps you.